A compact, well-defined dust devil with a clearly visible core, in the Nevada desert. On a hot and dry day in the American Southwest, it's common to see swirls of dust race across the landscape. They sometimes separate from the ground and soar high into a clear blue sky. Similar but much more pronounced dust devils, as they are called, are common on Mars. Both varieties are often likened to tornadoes. But in fact the mechanism behind them is completely different. T.J. Ringrose of the Open University in the United Kingdom has been studying the differences for years. The exact physics of martian dust devils remain to be pinned down, since only a handful have been photographed and none have been studied in detail. Now Ringrose has created miniature dust devils in his laboratory. The work, detailed in the October issue of the British journal Astronomy and Geophysics, is beginning to shed light on how the vertical columns form at varying angles, which is related to how fast the internal winds blow. Tornadoes form where warm, moist air clashes with cold, dry air. The warm air can rise to 50,000 feet, and because it's laden with moisture, thunderstorms develop. Rotation is induced when winds at the 10,000-foot altitude blow in a different direction than surface winds. Winds inside a tornado can exceed 300 mph in extreme cases. 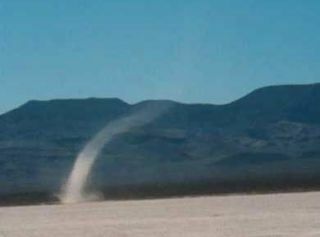 Dust devils are gentler, with winds typically matching freeway speed limits, and they have a completely different origin. They don't depend on storminess, precipitation or even humidity. When the Sun hits the surface of Earth or Mars in the morning, bubbles of air become much warmer than the air just a few feet above the surface, and the warm pockets rise. "This bubble effect is random and analogous to bubbles of gas rising in a carbonated drink, Ringrose explains. "When several bubbles join together they form a thermal plume." If there is even the gentlest breeze and some swirling caused by rocks or variations in terrain, the rising air can begin to rotate. This rotation causes the developing column of air to incorporate other rising bubbles. Once winds swirl and pick up speed, they can lift dust from the surface, which is what makes the whole phenomenon visible. On Mars, a dust devil will typically last just a few minutes, but it can carry hundreds of pounds of material into the sky. Dust devils contribute greatly to the global makeup of Mars, which is so dry and dusty that it is sometimes engulfed by global dust storms. The planet-wide storms don't appear spontaneously. They build over time, and scientists think dust devils are the seeds. Second, friction between dust particles electrifies dust devils on Earth, scientists learned in a 2004 study. They expect the same is true on Mars. But since dust devils on Mars can be bigger, it's possible the charge could zap a spacecraft's computer or endanger an astronaut walking on the surface. Ringrose's team has taken a first step toward a better understanding. The lab work has shown that "dust devils can be simulated in the laboratory and that they display the same fundamental characteristics as naturally occurring vortices," he says. The next step is to increase wind speeds in the lab to learn exactly what happens when surface material is lofted into the air.